One important part of the kitchen is the faucet because it is the source of water where we use for cleaning the utensils, kitchenware, and the food we are preparing. A wall mount kitchen has a lot more benefits than your usual kitchen faucet, such as it does not build too much bacteria compared to the typical one, and you do not have to drill holes to your kitchen sink. 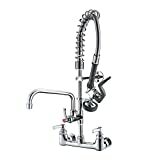 If you are planning to get one, here are some of the best wall mount kitchen faucets for your kitchen. 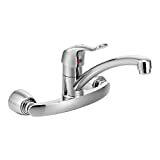 The classic style 3.63″-8.5″ made from Taiwan faucet. This faucet has twin handles and tubular spout. The handles are metal, and an 11″ spout reach from the wall. When it comes to the water measure it has a maximum of 1.8GPM/6.8 LPM water flow with a rate of 60PSI. The aerator fitted underneath the spout’s head is removable. This brass constructed wall faucet has a 10-year warranty and 1/4 turn ceramic disk cartridge, in addition, it is easy to operate. If you are looking for something classic and generates comfort to your home. This wall mount kitchen faucet is perfect. The next faucet is not a typical faucet that you mostly have seen at home. 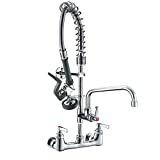 A modern industrial design for a kitchen, faucet with 23″ spout height, 8″ center handles, and 12″ spout reach. It has a heavy-duty spring with pull-down spray for easy use. An easier way to clean the sink, or if you need to reach something with water. Made from lead-free brass which includes high-performance neoperl aerator and a ceramic cartridge for it to become drip-free. For installation, it is very easy to install, and it includes all mounting hardware in the package. Very easy to clean rubber nozzles to prevent building hard water. The wall mount kitchen from BWE has no lead which means it is safe for your water to use it in washing the food. The two twin handles with a red and blue mark is a sign for hot and cold. You can adjust the temperature of the water by twisting the right color. Red for hot, and blue for cold. Constructed by heavy duty lead-free brass, and chrome body polished. It has double holes and ceramic cartridge that can survive up to 500,000 open and close. The water pressure starts from 0.5 bar up to 1.0 bar. If your water supply requests 1/2″ you can contact them, and if there is any problem with their product they have a customer service that usually replies within 24 hours. This wall mount kitchen faucet is mounted safely because of the vandal-resistant screws that help you to secure your faucet from unwanted tampering, and theft. It is not cheap to buy products like this, and it is your right to keep it safe from any harmful object, and people. 2 holes installation is needed for this one. Made from brass mirror chrome finish, this is elegant stuff on your kitchen. The M-Dura double handle features a gooseneck spout with two colored handles which means hot and cold. This offers an aerated stream of 1.5 gallons per minute. The blade size is 4 inch each blade, and the spout’s height is 12 inches and 8 inches for the reach. The package includes 1 piece of the faucet. The heavy-duty faucet from JZBRAIN can resist rust, and constructed with lead-free brass. The pull-down pre-rinse spray last for 100,000+ bends life span because the stainless steel sheath helps to increase the lifespan o it. The whole surface of the faucet is plated with chrome treatment, which makes it more appealing and better when it comes to heat resistance. The pipe can rotate at 360 degrees, which is a perfect kitchen that has double sinks. There is no need to worry about splashing water, because this faucet releases gentle and foamy water, and in addition, it is also clean and filtered. There are two sizes of spouts, the 214mm and 127 mm. They also give a discount when you choose to purchase with them. 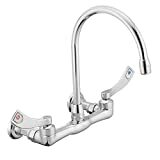 The 8″ adjustable central hole made from lead-free brass with rust-resistant finish faucet, this one is one of the best wall mount kitchen faucets this 2019. The outlet spout can rotate at 360 degrees, and it has a two O rings that enhance leak-tightness of the faucet that increases the life span of the wall mount kitchen faucet. The two O’s also means hot and cold which you can control the temperature of the water depending on your needs. It’s very easy to install that you can use your hands. The metal tubing for rinsing can bend back and forth for more than 100,000+ times, and the stainless steel sheath adds protection to the tubing, and faucet to prolong its life. The flexible metal tubing can be bending back and forth over 100000 cycles. We add a stainless steel sheath on the interface between the tubing and faucet to increase the service life of the tubing. This faucet may look like a typical faucet you can see everywhere, but this one is a hybrid. Constructed from solid brass with reflective chrome finish, and 1255 cartridge that gives smooth, and reliable operation to the owner. It is a two hole wall mount and can install easily by yourself, but if you want to assure that this can install properly because of the price of this hybrid wall mount kitchen faucet is not a joke, you can as for some help to the experts. The red and blue logos mean hot and cold, and if you want to adjust the temperature of your water, point it in the color that you need. This is to avoid too much hotness or coldness. 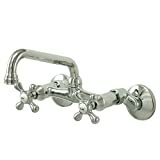 Let us go back to the old style of faucets because Kingston is giving us this antique look faucet. 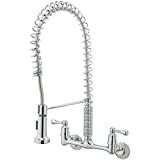 You know that a long time ago, faucets are designed to be wall mounted, that is why it is perfect for our category since we are talking about wall mount kitchen faucets. 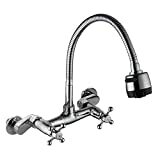 The ceramic cartridge ensures that the faucet will perform smoothly for a very long time. The spout’s design gives simplicity, and elegance to your kitchen sink, and the two cross handles labeled hot and cold controls the temperature and adds a hint of the past. The flow rate of the water is at 60 PSI. Made from brass to secure durability and so that it can last for a long time. The chrome finishes avoiding corrosion and tarnishing. The water measures at 2.2GPPM for a maximum rate. A removable beneath the spout’s head to conserve water flow. If you are a fan of cross handles, and sprayer, you got yourself a two in one faucet. The materials used in this faucet are premium brass and electroplated chrome to finishing. The double cross handle is to control the temperature of the water and with a sign of H and C stands for hot or cold. You can rotate the sprayer 360 degrees in all direction. There are two modes when it comes to water flow, a mode of the stream used for your daily washing dishes, and mode of spray for washing fruits, vegetables, and others. All the switches are tested that it can last 500,00 times and the hole distance is 6 inches. The installation distance is a minimum of 3 inches, and a maximum of 9 inches. 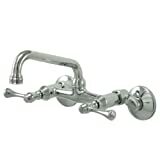 Our best wall mount kitchen is a simple two-handle faucet. It is designed to fit a two-hole wall mounted configurations with 7-9 inches hole between centers. It is flexible because you can swivel the high arc spout 360 degrees to give you the convenience you need every day to your kitchen, which is good for two-sink kitchens. The two handles give total control to the temperature to assure that you will get what you needed. The height of the faucet is 9.38inche, and the spout reach from the wall is 11.38 inches. When it comes to the price, it is cheap and it comes with a lifetime limited warranty. Now, you can install the wall mount kitchen faucet with confidence. The kitchen is one of the most important parts of the house since this is the place where you cook and prepare your food. When you go to someone’s house, the first thing that you will look is how they are in the kitchen because it will reflect on someone’s personality. That is why people are giving in extra effort to make their kitchen clean, and attractive since we are talking about the food preparation here. Know Your Kitchen- It is important that you know your kitchen very carefully. There are different sizes of holes in the faucet, and if you pick the wrong size, it can be a big problem. There are times that you do not have holes in your wall, or you only have a single hole, but what you need is two holes. The distance between the holes is also important. Budget- Not all people can afford expensive faucets; spend on something, which you feel is worthy. Pay for something durable that can last for a long period even when you use it for your daily activities. Spout Height and Reach- Look around where you will install it, and see if this thing is compatible with it. For example, having a tall spout may not fit if you have a cabinet above your sink, or if you have a 3-bowl kitchen sink, and the short spout will not reach them all. Before buying kitchen faucets, you must consider all the little things around it, because it matters. We give you a list of the best wall mount kitchen faucets to choose which one will fit your kitchen and your taste. All of these are tested, and proven to be the best, and will be worthy of your money. We do not have any control with these products.